I mentioned earlier this week that we haven't gotten around to hanging the doors in the sunroom yet. Those doors are a couple that I put together earlier this month. I wanted a simple design that would be sturdy and would look the same whether the doors were open or closed. I sketched out a design, picked up a small piece of plywood and some 1x2's from Lowe's and got to work. I started by cutting all of my pieces to size. 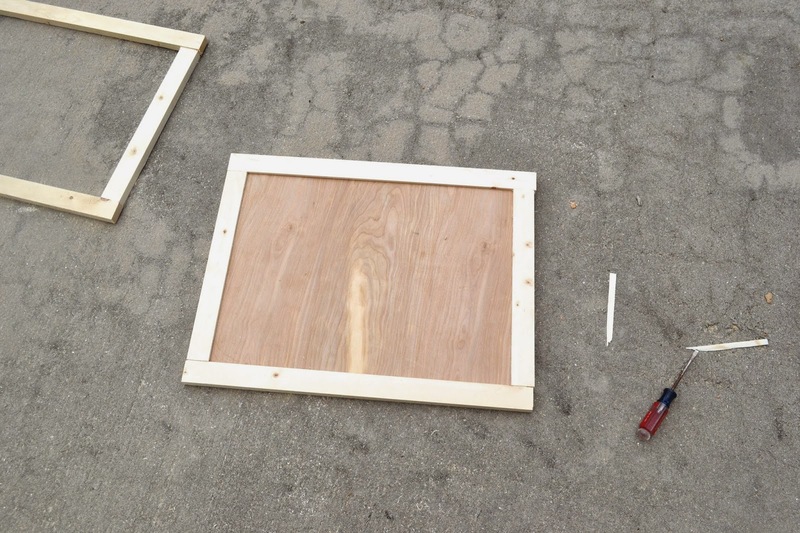 I measured the cabinet front opening and cut the 1x2's so they would frame out that space. 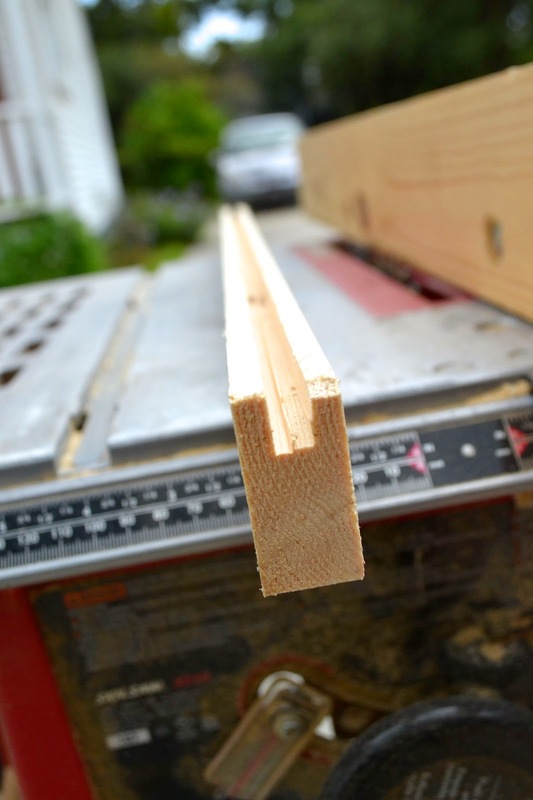 I then cut the plywood to be a inch narrower and shorter (1/2 inch on both sides). I normally leave the heavy powertooling to Nate but since non of the pieces were too big on this project, I went a head a did it myself. 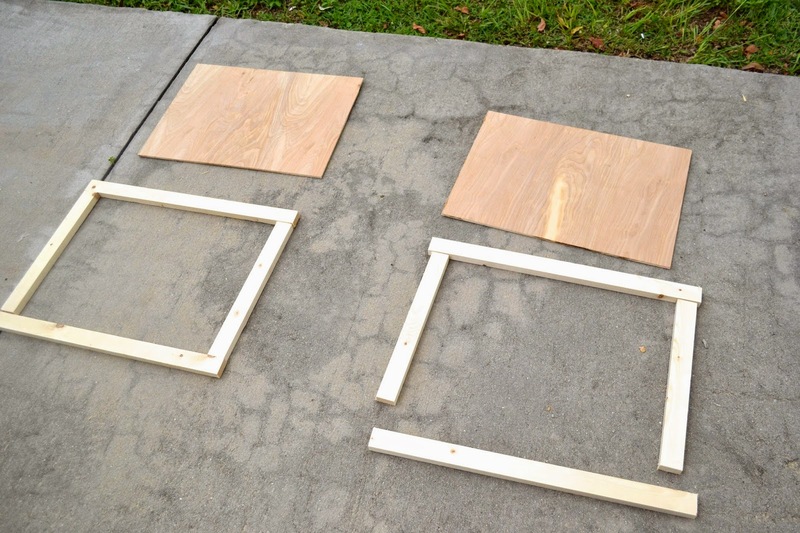 I used our table saw to cut the plywood down to size and our miter (chop) saw for the side pieces. 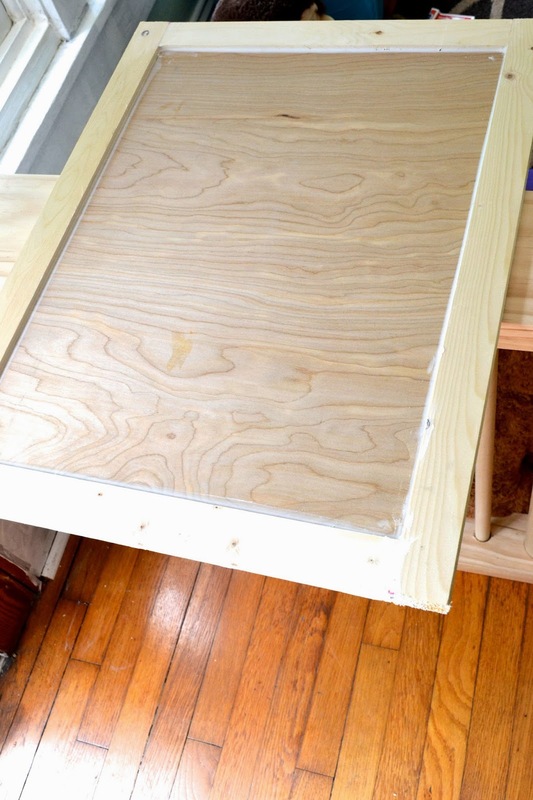 To make sure that the door looked the same whether it was open or closed, I decided to embed the plywood into the sides. 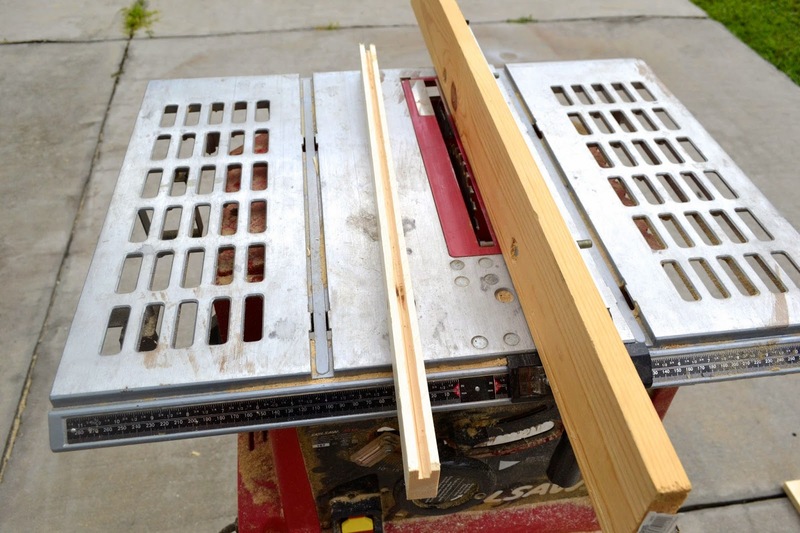 I set up the table saw so that it wouldn't cut very deep and there was a 1/4" space between the saw and the blade. Then I ran each side piece through. 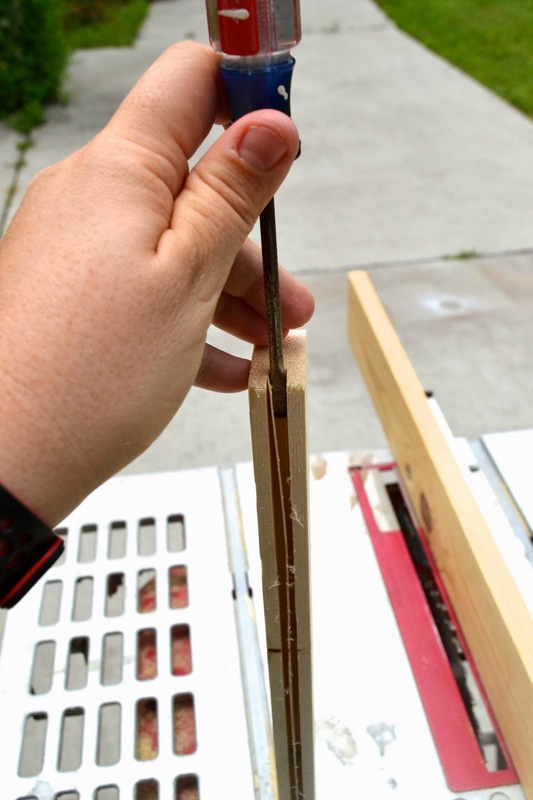 I had to do this twice, once on each side, and since the blade wasn't thick enough, I was left with a very thin strip of wood down the middle of my opening. It was literally hanging on by a thread so I was able to easily snap it out with a straight edge screw driver. 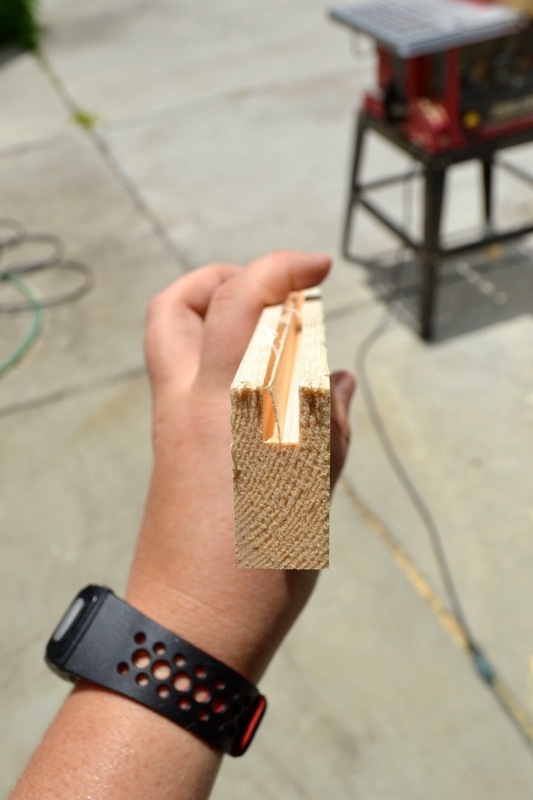 This left me with a 1/4" gap in the middle with 1/4" side pieces on both sides (a 1" is really 3/4"in case you're checking my math). I did a quick dry fit, trimmed down the plywood just a smidge and then was ready to assemble everything. This was where things got tricky trying to do this myself. I really needed three hands plus one to take photos but had to make due with just my two. My goal was to only nail into the wood and not the plywood and you can see there was some room to do that however it did not turn out to be an easy task. 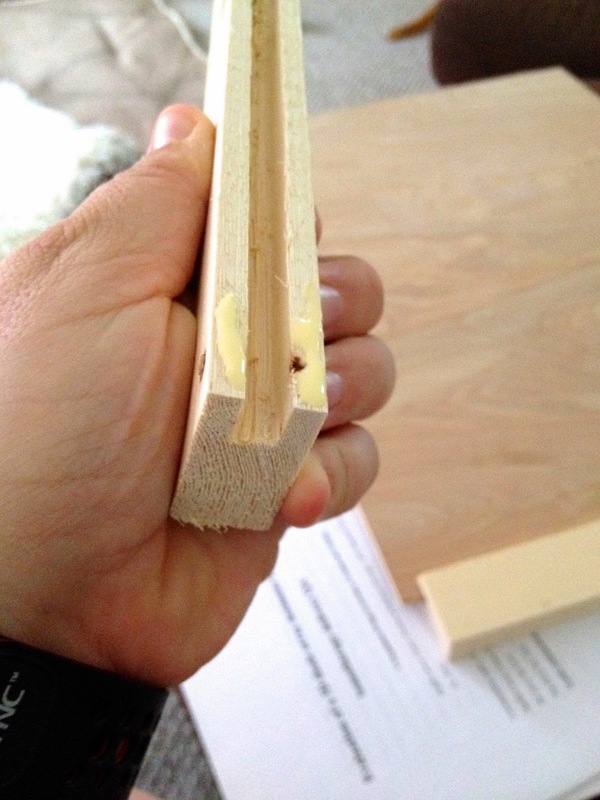 I glued the edges of the sided that would touch and then attempted to nail them together. This is when a few more hands would have been nice. At first I tried to do this by just holding the pieces together myself. 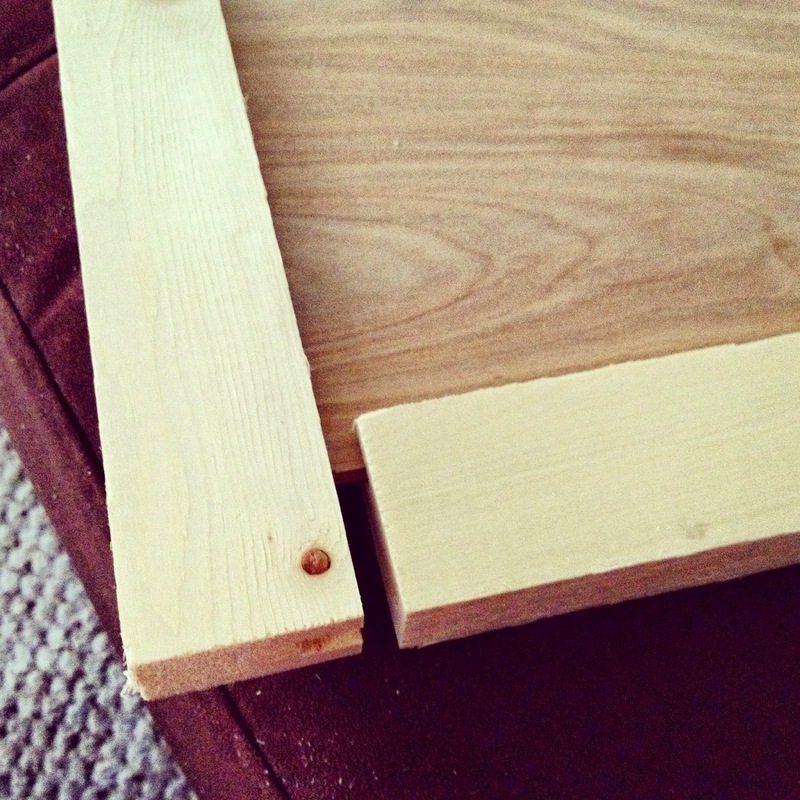 This didn't really work since nailing just one corner wasn't enough to keep the pieces together. Then I tried laying them flat on the table to help stabilize. 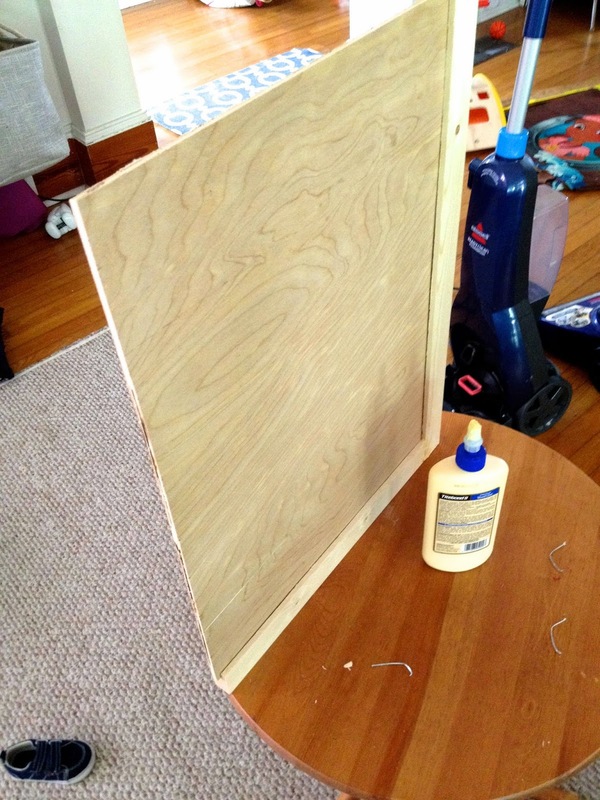 I thought this worked until I realized I nailed at an angle so the whole thing was nailed to the table (commence frustration) and finally I used the plywood to help. You can see a few of the many nails I had to rip out before I got this right on the table. Luckily, once I had a good method it didn't take too long to finish the rest. I caulked all the seams and let them dry and then the construction phase was complete. We still haven't hung the doors since I don't like the hardware we have for them so once we figure that out we'll be back with the finished built-in with the doors.